It's not everyday that you can call yourself pioneers, but this is exactly the case with York University's WIBI. Formerly known as WIBI Jazz'n, the group is a pioneer in vocal jazz as well as in the sense of being Canada's longest running collegiate a cappella group. Only a handful of other groups deserve such distinction as WIBI when it comes to both talent and longevity. This coming Monday night, you'll have a chance to see what they do best...sing. They are next hosts of "Aca Live" and it kicks off at 8:30 PM/ET on our Facebook Page. While you anticipate what is sure to be an incredible performance, learn all about the group in the interview below. WIBI was founded in 1988 as WIBI Jazz’n but have since changed our name to WIBI A Cappella as we evolved into the group we are now. We are inspired by international collegiate a cappella groups such as The Nor’easters and Faux Paz! 3. How does Wibi differentiate itself from other music groups on campus? What makes the group so special? We are Canada’s longest running collegiate a cappella group and the only a cappella group at York. 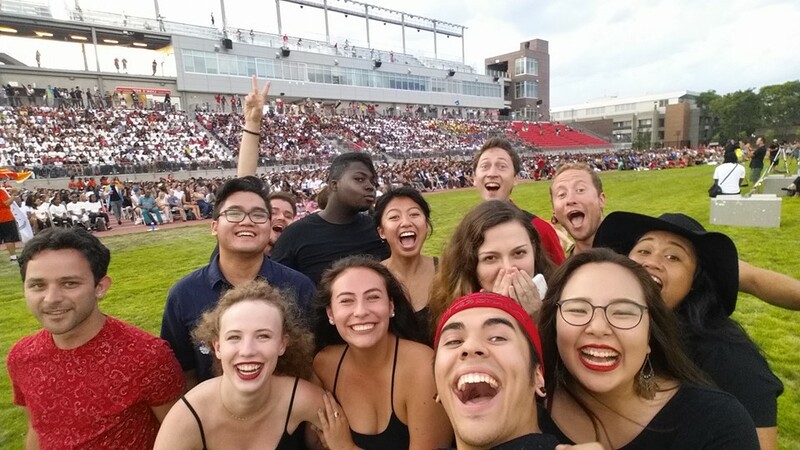 We are entirely student run, which means that directorship, arranging, and organization is all done through students here at York University. We are a tightknit group of musicians and non-musicians alike that share a passion for singing, performing and sharing the love of music. The next big project we are focussing on is our Spring Showcase which is in two weeks (April 3[sup]rd[/sup]). We are also gathering our resources to participate in next year’s ICCAs. 5. Last school year, your group participated in Tokens 4 Change. Can you tell us a little about the event/organization, how Wibi got involved and any memorable moments about the experience? We have been participating in Tokens 4 Change for many years and we are always excited to perform for this event and give back to the community. Tokens 4 Change is an initiative which strives to protect youth without shelter through fundraising and raising awareness. A Memorable moment was seeing the community come together to support this cause. 6. What are some things Wibi likes to do outside of music that contributes to your musicality? We like to engage in team building activities with the entire group, every year we go on a retreat where we spend a weekend together learning our repertoire and bonding. Collegiate A Cappella groups are definitely getting attention through the rise of popular media outlets such as Pitch Perfect and TV Shows like Sing It On. Recently A Cappella music itself has been revolutionized and evolving through the innovations of notable groups such as Pentatonix. 8. Are there any big plans for the future? Hoping to try out some new genres, collaborate with other groups, travel to perform, etc.? 9. Have you all ever experienced any weird or unexpected moments at a concert or performance? Our last showcase!!! During our first song, we had a light malfunction… One of our lights fell into the audience, luckily no one was hurt! 11. Wibi has roots in vocal jazz, as seen from various appearances on BOCA (Best of Collegiate A Cappella) and videos on your social channels. Where does this stem from? Because WIBI has such a long legacy, our sound is constantly evolving. Our roots were WIBI Jazz’n but we are now WIBI A Cappella. 12. Lastly, could you give us some background on the below photo from your Instagram? What was happening and what was memorable about it? This was a really happy moment for us! This was one of the retreats that we mentioned earlier, it is a perfect example of all of us pitching in. We all had a part in making this dinner, and WIBI truly felt like a family in that moment! It felt like a Thanksgiving dinner where the whole family gets together and spends time with each other, and sleeps in the same house! For more information on WIBI, connect with them on Facebook, Twitter, Instagram and YouTube.